I updated the sketch from last week’s post so that it now looks like the sketch on the right (click on it to make it larger). I replaced physics with reality in an attempt to be a little less obtuse. I also added “(Expectations)” to Beliefs. They are essentially the same things. This also gives me a place to hang The Stress Equation when combined with Reality/Physics. I changed the line from Facts to “modify”. Facts modify Reality/Physics. This seemed to be a bit richer way of thinking about how facts relate to reality. I added “(Issues)” to Opportunities in order to cover all the circumstantial reasons for decision. the distinction between the two is worth some deeper exploration at some point. In the meantime, read The Obstacle is the Way, by Ryan Holiday. Finally, I fixed the directions of the feedback loop arrows so they point in the right directions[1. Yes, I’m that kinda guy.]. 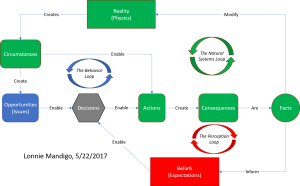 This sketch is only the barest outline of a framework for thinking, but there are some interesting observations that can be made. 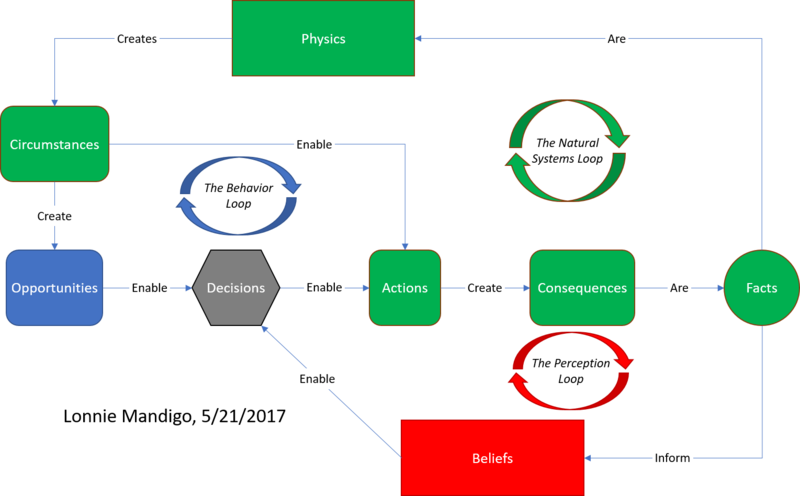 For example, the Natural Systems Loop is the universe without Thinking and Acting Beings. Note that I changed the title of this post to “Believing and Acting Beings”. Thinking is the process of forming beliefs. 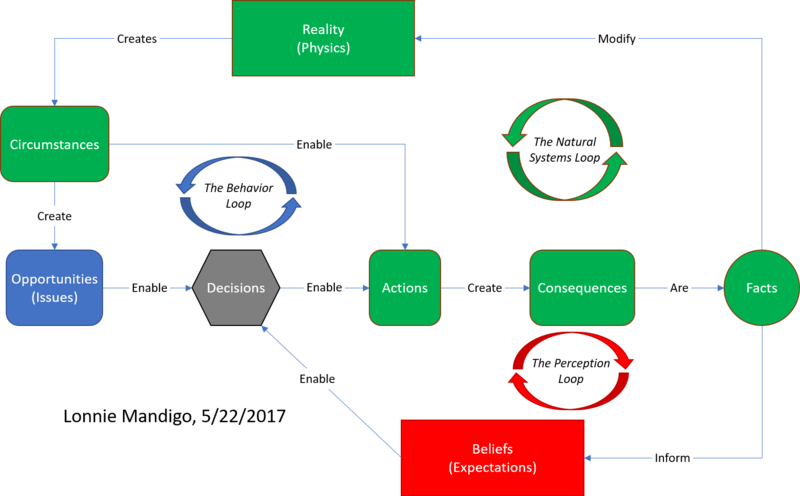 Beliefs are exposed by adaptive reactions to facts. All higher animals at least exhibit learning. Learning is an adaptive reaction to facts. This leads to the conclusion that all higher animals have beliefs. From this, I’ve formed the belief that while human belief systems are certainly extremely complex, at our core we’re no different than any other animal that learns. Your milage may vary. If so, I’d love to hear about it. An ongoing ponder is the role of leadership and purpose in the human experience. A purpose is a desired future state; also known as an objective. Purpose appears to be a very important element of the constellation of things that enable human happiness. Other than the mechanics of perpetuating the species, for humans, happiness appears to be what life is about. Purpose does not necessarily mean a desire for change. Many have an objective to avoid and inhibit change. They achieve that objective if today is pretty much like yesterday. For those it can’t get any better than what they have today. Purpose does not necessarily mean unique. Many have the objective to make the future in some way similar to the past. This is based on a belief that we have somehow “lost ground” relative to what’s perceived to have been a better state. For the rest, purpose is a belief that there’s a future state that can be achieved that’s in some way better than any that’s been experienced so far. For me, this is the kind of purpose that contributes the most to my happiness. I’ve moved from believing that people whose purpose is anchored by the past or the present are idiots to recognizing that I just don’t understand. Given that the past and present were at some point in time “the future” how could the future not hold even more promise? They have a point though. There have been some pretty dismal times in human history. The future may also contain more of those. I believe that the objectives that you choose are a function of your personal strategy. Two extremes are a “strategy of fear” and a “strategy of hope”, otherwise known as pessimism and optimism. The strategic landscape isn’t single dimensional, of course. An important orthogonal axis is idealism vs. pragmatism, which is a trade-off between what you want to be true and what you may know to be true[1. The nuances of “truth” I’ll defer to a future post]. For most people their personal strategies are likely set as they exit adolescence. After that it’s largely a sorting exercise. Most people don’t create their purpose. For many their purpose is default. It’s all they’ve been exposed to. They may not have even been made aware that they can select a purpose. This is the disruptive power of education. It exposes a person to alternative objectives and empowers them to select. For a few it goes even further. It empowers them to create a purpose that is new. These are innovators. What’s the job of a leader? The roles of followers; managers and technicians. A bunch of things I haven’t thought about yet. If you are a leader, you have one job and only one job and that’s to provide a purpose. If you are a manager, you have one job and only one job and that’s to remove the barriers that keep the team from achieving the purpose. If you are a technician, you have one job and only one job and that’s to contribute to the work that realizes the purpose. If you believe anything else about your job then you should be fired.